Join wine writer Natalie MacLean’s wine and travel world as she jets from one continent to another, from one wine region to the next exploring her passion for wine and highlighting some of the best values out there. 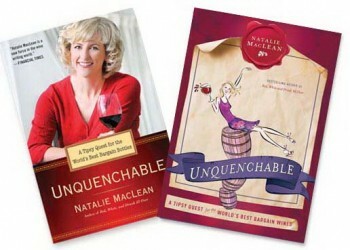 Her style of writing is engaging, lively, and informative to the wine novice and educated consumer alike. She meets with owners and winemakers and explores the “stories” behind the wine. The book highlights the uniqueness, differences, and challenges that winemakers face in their respective regions. It is a wine book with truly a global perspective. At the end of each chapter/region Natalie highlights top producers, pairings and lists other resources and recommended related reading materials. Wine lovers will delight in this latest “chapter” of Natalie’s wine writing career.